On the eve of the 2018 NFL Draft, the New York Giants offensive needs were obvious. Get offensive line help, secure a quarterback for the future and add a playmaker to the backfield. When the weekend concluded, New York had done all three, albeit in a curious order. Saquon Barkley, Will Hernandez and Kyle Lauletta were added over the weekend to the league’s worst offense from a season ago, but will they be enough to save a Giants offense that has been in free fall over the past two seasons? Let’s take a look at exactly what we can expect from them in 2018. Head coach Pat Shurmur said in a press conference after the draft that Barkley will be on the field for the Giants “as long as he can handle it.” It has been a few years since he had a true dual-threat running back in his offense, but Shurmur’s time in Philadelphia shows he meant what he said. LeSean McCoy was second among running backs in total snaps in 2013 with 890 and fourth in 2014 with 790 before being shipped off to Buffalo. One can certainly expect similar snap counts from Barkley as a rookie. In that same press conference, Shurmur talked about how receiving ability was the first thing he looked for in a running back prospect. As much as that may be true, featuring running backs in the passing game has been a rarity for recent Shurmur coached offense. The Vikings quarterbacks threw to backs on only 18.9 percent of their targets a season ago, with the total running back targets in Shurmur’s offenses by year shown below (the league average last year was 103). That’s only one season of the last five where Shurmur took full advantage of his backs in the passing game. As was said before, 2013 and 2014 would be the most corollary examples, as that’s when Shurmur’s offense featured McCoy. The outlier in 2015 is more the result of Darren Sproles‘ ability than anything else. Sproles was pumped for 73 targets that year on 256 routes for a ridiculous 28.5 target percent of his routes – with many of those coming as a receiver split wide. The good news for new quarterback Kyle Lauletta, and possibly bad news for Eli Manning, is that Shurmur’s offense has been for the most part a short, timing-based passing attack. The type of offense that prioritizes accuracy over special throws down the field. Case Keenum had the seventh-shortest average depth of target in the NFL this past season while Sam Bradford had the shortest in 2016. Of all the top quarterbacks in this draft class, Lauletta had the second-best rate of perfectly placed passes (accuracy-plus) and the second-lowest percentage of uncatchable passes. It will obviously be a big leap in competition and he’ll have a while to learn on the bench, but Lauletta’s strengths look like a perfect fit for what Shurmur wants to do. It’s no secret that the Giants running game has been an unattractive mess over the past couple seasons. They averaged 3.9 yards per carry a season ago and 3.5 yards per carry in 2016. While it would be great to fix those issues, it’s worth asking the question of whether or not that’s going to fix the issues of the offense as a whole? How quickly we forget the Giants won the Super Bowl back in 2011 with a similar rushing attack that averaged 3.5 yards per carry and was dead last in the NFL in expected points added. Even if you buy into the old adage that a strong running game makes the passing game better – a claim we’ve found nothing in our data to back up and obviously didn’t hold true for the Giants in 2011 when Eli Manning had the highest-graded season of his career – the analytics say that run-blocking performance is far more strongly correlated to success in the run game than individual running back performance. Ergo, a generational running back isn’t as valuable to a rushing attack as a solid offensive line. The solid offensive line also has the added benefit of solid pass protection (usually) as well. If you are so inclined to ‘establish the run’ it would behoove you to do so with the big fellas up front first. 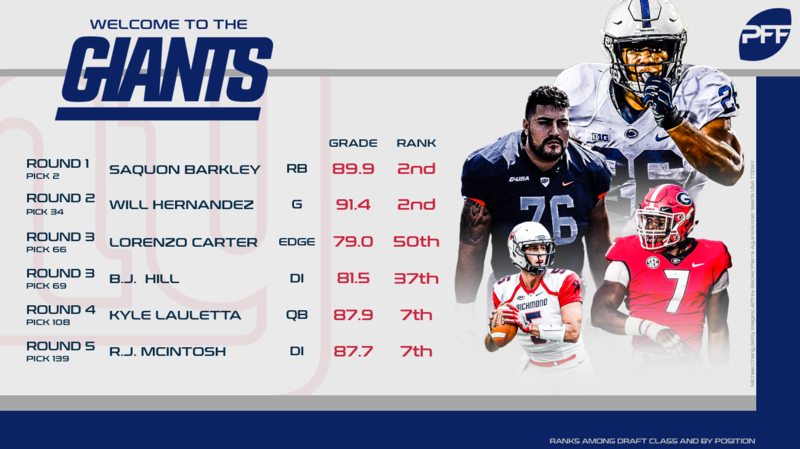 And while they did just that at the top of the second round with UTEP guard Will Hernandez – who we pegged as a top-20 talent in this draft – they still have gaping holes at center, right guard and right tackle. 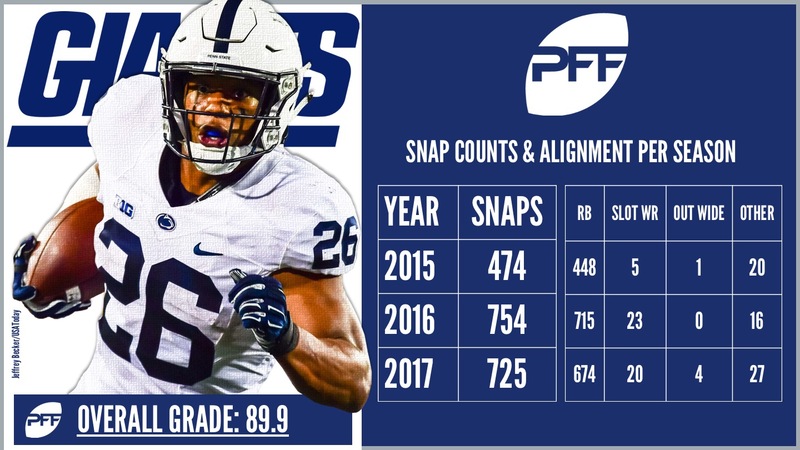 With the quality of run-blocking in front of him, it’s going to be nearly impossible for Barkley to have consistent success in the running game as a rookie. The simple fact of the matter, unless you have a truly dominant offensive line, you don’t want to be run heavy in today’s NFL. Taking garbage time out of the equation, the expected points added on the average run play is -.05 while the expected points added for the average pass play is +.05. Only four teams had a positive EPA on running plays a season ago (21 had positive EPA on passes) and unsurprisingly, all the successful rushing teams had quality offensive lines (Cowboys, Packers, Saints, Browns). Team passing and coverage grades correlate strongly to winning while team running and run-defense grades have no correlation. The last four Super Bowl champions have been led in rushing by former undrafted free agents. Six of the last nine Super Bowl champs haven’t even featured a 1,000-yard rusher. I could go on all day with examples. If the Giants have ideas of using Saquon Barkley as a 20-carry per game bell cow, they’re simply wasting the No. 2 overall pick. Barkley is a freak of nature that no linebacker in the league can match up with athletically. To get some ROI from their top pick, they’d be smart to force feed him the ball in space and split him out wide as much as humanly possible, ala Darren Sproles’ role from 2015. Creating something out of nothing and giving Eli easy, open throws down the field is what will actually take the pressure off of him. The good news is the Giants offense will be much improved in 2018. The bad news is, after averaging only 15.4 points per game in 2017, that still might not be enough. With Odell Beckham Jr. back healthy, Evan Engram heading into Year 2, Barkley in the backfield, a new left side of the offensive line and a new offensive scheme that at least can’t be worse suited for Manning, there are no excuses for the veteran quarterback. At 37 years old, Eli the exact same age as his brother Peyton was when he put up the greatest statistical season of all-time. Even though his grades have been trending steadily downwards since 2011, the Giants front office gave their two-time Super Bowl champion a huge vote of confidence this offseason. If he repays them by turning back the clock, they’ll look like geniuses. If his downward trend continues, the Giants will have their hopes pinned to a fourth-round rookie from Richmond.